The Gilas Pilipinas having their first defeat in the Tune-Up games for the Fiba World Cup 2014. 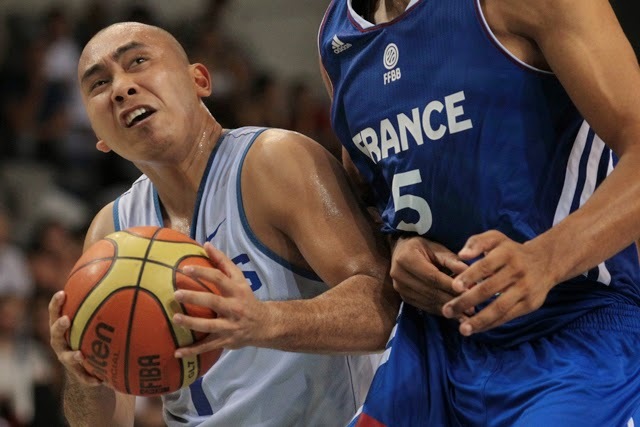 The Gilas Pilipinas loss by 6 points 75-68 from the European champion France in Antibes last Friday (August 15, 2014). Andray Blatche finished 12 points same with Paul Lee, along with Jeffrey Chan who scores 9 points and De Ocampo and Alapag who helped with their 8 points. The France Team was losing 5points (60-55) in the fourth quarter but they came back with the 20-8 run over the Philippines. The NBA Player Nicolas Batum lead the scores in France with his 14 points in the second half, and 12 rebounds to lead the home team. The France team has a lot of NBA Players including Pietrus who added 10 points, Mahinmi and Gelabale with 5 each and the NBA 2014 Champion Boris Diaw who also played but scores only 1 point. The game ends in 75-68 wins by the France Team. The next tune up games of the Gilas is vs the Australian team on August 16, 2014.